These Razzle Dazzle Egg Ornaments are a great Easter kids craft. A unique twist on regular clay ornaments, and a great gift as well! To make this craft you will need a clay ornament. You could buy one, but why? Make your own with our Easy Craft Clay recipe. 1. If you are using craft clay, roll your clay out to about 1/4" (about the same thickness as a sugar cookie). Cut out an egg shape with either a cookie cutter, or free hand with a knife. 2. Place on a cookie sheet overnight or until hard. If you can, flip it over after the top is dried so that the bottom can get some air to dry too. 3. 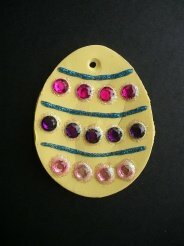 Paint your egg, once dry, glue on a jewel and then put glitter glue around the jewel. It's easier if you glue the jewel down first, then it will stay in place while your putting on your glitter. Also, it's better if you just do one jewel at a time.